While the primary measure for an item dictates how it is stocked (most commonly an Each), it may need to be bought, sold or used in production with different measures. A Unit of Measure Set will define how your items are sold, purchased, and used when it is different than the primary measure. Setting multiple units of measure will customize a Unit of Measure Set to be processed as you define them in the system. (i.e. System will read your items as each, but customize to sell, purchase, and used as they have been pre-assigned). 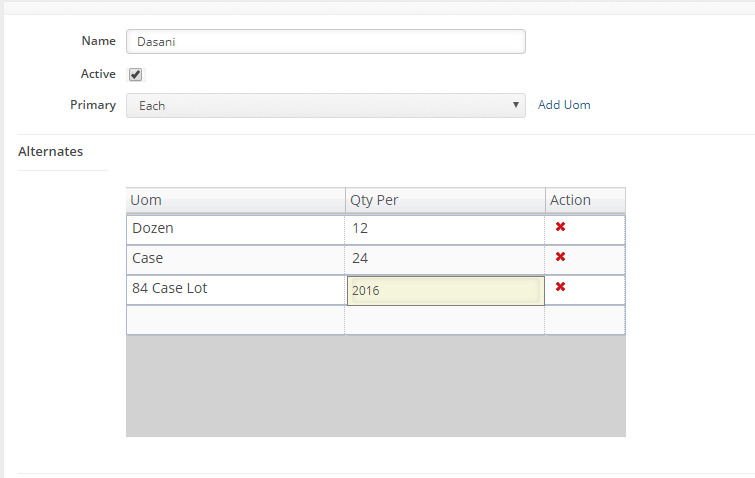 To allow the system to Sell, Use and Purchase using multiple units of measure select "Enable Multiple Units of Measure" preference in Company Preferences > Items. Once you have selected this setting, you will not be able to go back to original setting. The primary unit of measure is how quantities are stocked. (The quantity on inventory reports, item details and inventory counts etc). The other units of measure along with the associated conversion rates are used to display meaningful quantity information to users, customers, and vendors. If you inventory, sell, buy and use in the same unit of measures then you don't need to complete the units of measure sets section. The X is the conversion rate from the primary unit of measure. If the primary unit of measure is Each and you purchase the item in dozens, then the conversion rate is 12, meaning 12 EA per DZ. A good rule of thumb to bear in mind is if a unit of the new measure will be larger than the primary measure, the Qty Per will be greater than 1. If it is less, it will be a decimal and less than 1. A 1 in the Qty Per means the new measure will match the primary measure and no conversion will take place. Example 1 - XYZ Co. inventories juice by the gallon and uses it during production in quarts. XYZ uses 1 quart= .25 gallons. Example 2 - ABC LLC inventories widgets in Each but purchases them in dozens. Using the formula 12 Each = 1 Dozen. To create a custom Unit of Measure Set, click on the Gear icon, select Profile List under the General section. On the Profile List Screen, select UOM Sets from the General section. Once you have selected UOM Sets from the Profile Lists (Gear Icon> Profile List> UOM Sets), the screen will open. Enter the name for the Unit of Measure. Under Alternates, you can enter a set of units of measure with Quantity Per assigned to each unit. List all possibilities that may ever be used for buying, selling and using in production in this list. Under default selection, select from the alternates that you have just entered which will be the most commonly used and therefor by the preselected option depending on the type of document the item is being added to. Once you have established a UOM set, it can be used to create a new item. You can give the item the properties for this Unit of Measurement. Now that you have determined your UOM Sets, you can change the UOM on any line item to one of the alternates. On any line item, click on edit action icon to navigate to the line item editor. Once on the line item editor, click the UOM hyperlink and you will see the Change unit of measure dialog box. Select the desired UOM by clicking the its hyperlink.